These remarks appeared in a comment on this site recently. I can agree with so much of what you say. But I wonder why you would put yourself in the position to be either slaughtered, or possibly corrupted by the big American political machine. It is true that Jesus was an activist – of sorts – but He was active for the Kingdom of His Father, and not against the corruption of Rome. He rebuked the religious leaders of His day, but not for political reasons. Can you speak to the parallel I have just drawn? Jesus clearly did not fit in well with the political (power and money) systems of his day! He avoided the corrupted involvement model (Pharisees, Sadducees, Herodians), and he avoided the active revolutionary model (Zealots). But he did not avoid those models by avoiding those people, their ideas or their pet issues. Still, if he aspired to any sort of formal leadership position in the society of his day, he did not pursue such position by the common means. He often spoke out in unappreciated ways on issues that â€˜the establishmentâ€™ would have preferred not be discussed openly at all, or that the Zealots would prefer to be ‘discussed’ more violently. He did fill leadership roles in various synagogues, which says a lot about his credibility and the respect with which he was regarded, at least in the early phases of his ministry. But he also fairly frequently and publicly insulted leaders (in all areas of society – especially in the synagogues and the temple system, but also in finance and in government), even sometimes while an invited guest in their homes, or an invited speaker in their synagogues. The Risks of Compromise – or Worse – Are Widespread Throughout Society. They Do Not Threaten Only Politicians. To live in this evil world is to be in â€œthe position to be either slaughteredâ€? (as we see happen to innocent people in the news daily), â€œor possibly be corrupted by the big American political machine.â€? As to that, a LOT of people not in politics per se are being corrupted by the big money-and-power machine (and a lot of others are being damaged or destroyed as a consequence). Many Christian leaders and pastors who do not aspire to political or governmental positions are deeply corrupted, and are serving that beast energetically, just as many leaders in the synagogues and in the temple-system did in Jesusâ€™ day. Being active in the world in any capacity means you confront and/or live with that beast. For an American, to choose to try to serve in politics or government puts one in moral danger in ways that are similar to the moral dangers that come with serving in Gospel ministry, in an insurance company, as a teacher, or on an assembly line. You have to decide if it fits your gifts and your situation. You have to choose to serve with energy. And most of all you have to be willing and able to function with integrity. If the particular part of the beast you are working in cannot take that, it will vomit you out one way or another. 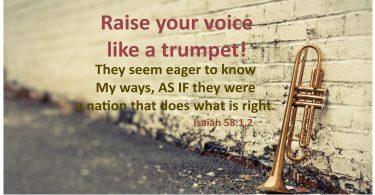 Jesus very blatantly and consistently served a different agenda (his Father’s purposes) and â€œmarched to a different drummerâ€? (his day-to-day strategies and activities). He avoided the Sadducee and Pharisee options – hypocritical and exploitative serving of and feasting on the corruptions of the established powers. But he also very explicitly avoided the â€œZealot optionâ€? (physical conspiracy against the ruling elites and their agents). And he did not at all pull back from calling things just as he saw them. The proof of his perceived dangerousness to the political, military, and religious establishments is that they felt they had to get rid of him in order to protect “their place and their nation.â€? Thank you for the good question. If I have any second thoughts about this venture of running for office, they do not arise from questioning whether Christian activists should seek positions of public responsibility. They arise from questions about where my personal gifts and calling lie. We will find out where the Lord puts me, eh? I look at the politicians and even church leaders today, and it’s hard to see the “Christian” because the “politician” has taken over. If you can pull this off, and I pray that you can, you will be one of the very first.